Only recently, though, have I started to notice these other strange specimens in the produce aisle of my grocery store: actual heads of lettuce. And so, the other day, while testing a salad recipe taught to me by a California chef, a recipe that required any good green lettuce, I swept past the pre-packaged stuff and bought myself a head of the good green stuff. 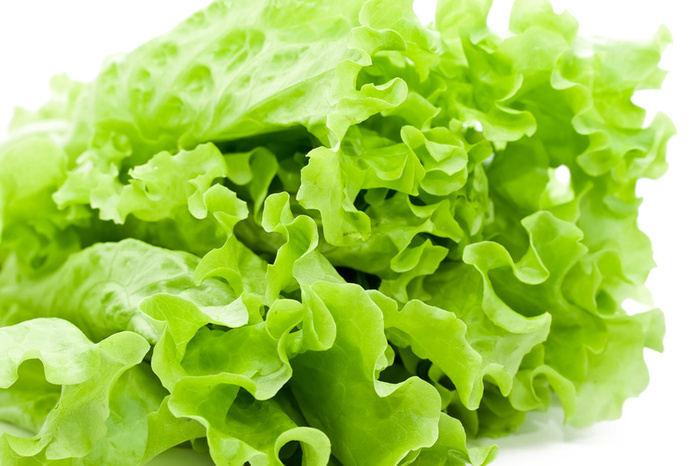 It was just a simple head of green lettuce–not iceberg, not romaine–it was simply labeled “green lettuce.” I bought the green lettuce and took it home. Once at home, I discovered a few things about this lettuce. For starters: unlike the stuff in the plastic tub, it wasn’t pre-washed. There was dirt on it. The old me might’ve thought “sick! dirty lettuce!” but the new me is very well aware that lettuce grows in the ground and if there’s dirt on it? That’s actually a good sign. So I washed the lettuce by dunking it in a big bowl of cold water. I separated the leaves before I did this, so each of them would get clean, and then I spun the leaves dry–a few at a time–in a salad spinner. When I was done I had a big bowl of green lettuce that wasn’t anything like the lettuce I’d been buying in those green tubs. For starters, this green lettuce had character. One bite, and there was a little bitterness, a little sweetness, and a good crunch. Also, unlike the lettuce you buy in those tubs, each of the leaves here had their own distinct personalities. Some were fat, some were thin, some were paler, some were darker. By the time I assembled the salad I was testing, I felt like I’d had something of a breakthrough. Why have I been buying pre-washed tub lettuce all these years? Why haven’t I been buying the real thing? The next time that you buy lettuce, I suggest that you really buy lettuce. You’ll be surprised by what a big difference it makes.